The team, behind your team. Chris was born and raised in Memphis, TN. Chris was a 4 year varsity letterman at Christian Brothers High School, and helped lead the “Brothers” to back to back State Championships concluding both championship seasons with a national ranking in the top 25 as rated by ESPN and Baseball America. During his high school summer years, Chris played for the Dulin's Dodgers out of Memphis, TN. Following high school, Chris played collegiately at various levels from Union University (NAIA) to Jackson State Community College (JUCO) to University of Memphis (D-1). Additionally, Chris played in the Northwoods League for the Thunder Bay Border Cats in Thunder Bay, Ontario. Chris had the opportunity to play in the Minnesota Twins minor league system; unfortunately, due to a nagging shoulder injury following shoulder surgery, his playing career was cut short. Following Chris’ playing career, he moved to Dallas, TX in December 2005 and worked in various roles with Bank of America from 2005 through 2013. After playing for and learning from great coaches like Charlie Lea, Dave Anderson, Tim Dulin, Joe Platt, and George Sykes, to name a few, Chris began his “new baseball career” in 2009 by getting involved in coaching and providing private instruction to kids around Dallas, TX. Finding a new love for the game and a passion for helping, guiding, and mentoring kids, Chris took his outlook on baseball to a completely different level. In 2014, Chris was selected to coach with USA Baseball National Team Identification Series. In 2015, Chris led the 13u North Texas Team USA to a Silver Medal. In addition to his role with Diamond King Baseball Academy, Chris also serves as the Chief Financial Officer for Kelley Bats, National Sales Manager of Herring Bank, VP Sales & Marketing of Black Tie Moving as well as President of the University of Memphis Alumni Association – Dallas Chapter. As a Performance Coach, Steve prepares athletes and coaches to succeed from the inside out. Mental and emotional tools and training are essential for maximizing performance potential. The Hecht Effect provides athletes and coaches a path to mental and emotional success. He provides tools and techniques that help athletes and coaches immediately and consistently perform at a higher level. Steve has coached in the Major Leagues with the Texas Rangers and Seattle Mariners, after playing 9 seasons of professional baseball. He has worked with numerous Major League and minor league coaches and players, as well as coaches and athletes from a variety of sports. Steve enjoys instructing coaches and athletes at every level. He teaches athletes and teams specific skills relevant to their sport. Steve has served as the Baltimore Orioles Mental Performance Coach for the last 2 seasons. Steve Hecht was drafted out of high school by the Pittsburgh Pirates in the 13th round, but he declined the offer and chose instead to play at the Division I collegiate level. Drafted again in the 5th round in 1987 by the San Francisco Giants, he played 9 years of professional baseball. In 1987 he was honored to be a part of the Silver Medal winning USA Pan-American Baseball Team. In 1989, he was a California League All-Star and the All-Star MVP. In 1990, he was a Texas-League All-Star prior to being traded to the Montreal Expos. He retired as a player in 1996. Steve has a Bachelor’s degree in Psychology, an MA in Management and is currently working on a PhD. in Psychology and Behavioral Medicine. As a Sports Performance Coach and Organizational Training Consultant, he has worked with coaches, players, and executives from various organizations and corporations. He has also authored and published the successful online personality assessment www.CareerFitter.com as well as The Hecht Effect. The Hecht Effect is a book that was developed in locker-rooms, clubhouses, and on athletic fields for athletes and coaches. Steve has been in baseball for 30 + years, both as a player and Major League Coach. The Hecht Effect is an intense focus of what works to improve athletic performance at the highest level. Athletes and coaches learn "how" to enhance performance, while the "why" becomes secondary to results. Jason grew up in Texas and has been around the game of baseball for over 30 years. Jason played collegiately at Paris Junior College and Northeast Louisiana University (now known as University of Louisiana – Monroe). Following his college career, Jason continued to play competitve baseball in local leagues such as DABA (Dallas Amateur Baseball Association) and NABA (National Adult Baseball Association). Jason will be running all day to day operations. Jorge Hernandez coaching background includes assistant coaching positions at the University of Mobile from 1993 – 2001 and Texas A & M University -Corpus Christi Tx from 2001 – 2003. 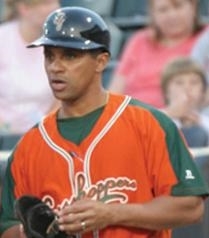 Jorge then went on to coach the Pensacola Pelicans Independent League from 2003- 2005 followed by a coaching position at the University of West Florida from 2005 – 2007. In 2007, Jorge joined the Florida Marlins organization as a hitting coach for 2 seasons. Over the last 5 years, Jorge has been a minor league manager with the Florida Marlins. Recently, Jorge was promoted to Infield Coordinator with the responsibility of overseeing all infielders in the Florida Marlins minor league system. Jorge was recognized as the Florida Marlins Development Coach of the Year in 2009 followed by the Gulf Coast League Manager of the Year in 2010. For private instruction rates, please click the “Services” tab, then the “Lessons” subtab. Gil played high school baseball at Newman Smith High School where he was 2 time All District Selection, District MVP and and All State Selection. Post high school, Gil played a various colleges from North Central Texas College as well as Navarro College where he was named NJCAA All Conference, All Region and All American. Gil finished his career at UT-Arlington. Following his collegiate career, Gil has continued his passion and love for the game of baseball by providing excellent private instruction. For private instruction rates, please click the “Services” tab, then the “Lessons” subtab. Growing up in a Major League Baseball clubhouse watching his Dad, Bert Blyleven (MLB Hall of Fame Class 2011) play, Todd traveled the country learning the game of baseball from some of the greatest players, and coaches in baseball. He remembers having one of his first hitting lessons with the great Willie Stargell, taking ground balls next to guys like Cal Ripken and Ozzie Smith, working on fly balls and hitting with the legendary outfielders Kirby Puckett and Ricky Henderson, and pitching not only next to my dad, but with guys like Nolan Ryan, and Frank Viola. Todd played professionally for 7+ seasons in the Angels, Pirates, and Brewers organizations, and then worked as an MLB Scouting Supervisor, and scouted for over 8 years with the Angels and Rockies organizations, winning a World Series Ring with the Anaheim Angels in 2002. Todd was recognized as the Southern CA Scout of the year in 2003 and 2006. Todd signed over 26 players to MLB contracts, one being MLB Super Star, Troy Tulowitzki. Coach Todd has worked with Big League players, and pitchers down to youth athletes for over 25 years, while also managing elite nationally ranked travel baseball teams for over 10 years. Author of, “The Art of Pitching” digital book that teach you how to be a better pitcher, Todd also has a son, Dylan, playing in the DD system and is a freshman at Reedy HS this year. Todd is also a Professional Consultant to MLB and Baseball Factory. Haygood, a native of East Texas, graduated from Airline High School in Bossier City, LA and went on to become a four-year starter as a middle infielder for Louisiana Tech from 2001-05. The four-year letter-winner continues to rank second in school history for doubles in a season, as he totaled 20 as a senior for the Bulldogs. In his playing days with the Bulldogs, Haygood led the team in stolen bases (21), runs (49), at bats (233) and games played (58) as a junior, while leading LA Tech in runs (41), doubles (20) and triples (2) in his senior season. After completing his collegiate career at Louisiana Tech, Haygood went on to play two years of professional baseball with Shreveport and El Paso in the American Association League. He has earned a bachelor degree in Kinesiology & Health Promotions and a master degree in Sport Administration from Louisiana Tech, as well as a master degree in Exercise Physiology from UT Arlington. Prior to starting W Sports, Haygood was an assistant coach at Alabama A&M University, Louisiana Tech University, and a graduate assistant for UT Arlington from 2011-2015. He also spent two season as an assistant coach for Loyola College Prep in Shreveport from 2010-11.